In Part I and Part II of this series, I told you how desperately public universities play the U.S. News & World Report rankings game. Public academia appears to be unable to grasp the fact that school rankings are an elaborate scam set up to boost private schools and provide them with steady income and prestige. This obsession with rankings also plays to the recurrent thinking in the U.S. that unless you are rich or an already highly-educated, ready-to-use immigrant like me, you are not worthy of a decent life and it is your own fault. Yeah, shame on you, why aren't you rich or well-educated? In Part I and Part II, I also suggested that in undergraduate education public universities would never win or place high in the current rankings scam. Simply put, the rankings carrot is dangled from much too high for the public universities to bite, no matter how hard they try to jump. Since I spent 18 years as a faculty of the University of California at Berkeley, and have students who are now professors at Stanford and MIT, I must tell you that Berkeley is not 18 notches beneath Harvard. In fact, one could argue that the rich and complex social ecosystem of Berkeley puts Harvard to shame most of the time, while costing Californians four times less. So if Berkeley = Harvard in overall rankings, why should UT Austin be number 52, after some no-name private colleges? With all due respect, why is a Washington University in Saint Louis number 19, while Berkeley is number 20 and The University of Texas at Austin is number 52? Has anyone heard about a Wake Forest University? I certainly haven't, but it ties with UC Los Angeles, University of Southern California, and University of Virginia for the 23 place in the U.S. News and World Report. Have we gone mad? OK, so we have gone mad and public universities are now focusing solely on graduate rankings, feeling correctly that in this domain they can still compete with private universities. But there is a hitch: The public perceives public universities as insufficiently caring about their sons and daughters, almost all of whom will never go beyond an undergraduate B.S. or B.A. degree. Few Americans ever get a graduate M.S. degree and far fewer a PhD. degree. Especially in science and engineering, Americans seldom enroll in graduate schools. A vast majority of all PhD. students in these areas is foreign born. We continue to bet that most of the freshly-minted PhDs will stay here and run the technical side of U.S. economy. The top echelons of politics, diplomacy, law, banking, finance, insurance, and the military-spying-police-entertainment-industrial complex are reserved for the Americans graduating from top private schools. This sophisticated cast system has brought to the U.S. a dismally low social mobility, marginally higher than those in the almost failed United Kingdom and Italy, and five times lower than those in Norway, Denmark and Finland. The current fixation with graduate academic rankings palpably hurts public universities, because they fail to see what the public supports and how their own faculty should be rewarded. These two points are significant, because public universities have now lost much of their public support, but they have not become private universities shielded by the giant endowments and tuition charges that subsidize and maintain their unquestioned royal opulence. Public universities usually receive strong support from their alumni and falsely assume that this support extends to the general public. It does not. In Part II, I quoted Edward Bernays, one of the greatest public communicators of all times, who 80 years ago pointed out that "The public cannot understand unless the teacher understands the relationship between the general public and the academic idea...."
It's that simple. If public universities want to continue serving a large number of ordinary families, we need to be in tune with what these families care for. The public cannot be hearing from us only how great we are in research, and how they should help us fulfill our scientific destiny. The public simply doesn't comprehend what we are talking about. The public wants to hear what great things we can do for the society in general and their children in particular. The grievous disconnect between public academia and the general public is a side effect of the con game in which public academia has been ensnarled. The purpose of this con game is to strengthen private schools and weaken public ones. And thus we, the oh-so-smart faculty, are drowning only because we must prove to ourselves that we are as good as the private princes of pristine science. Well, we are actually much better. Try to imagine private schools running on one quarter or one fifth of the resources they are accustomed to and do as well as we do! Just look at the three figures below, and Part I and Part II of this blog. For God's sake, wake up you public academic teachers and tell your bureaucrats to shape up! By the way, many of these bureaucrats live to play the rankings game and nothing else matters to them. This means, in particular, that they are less than truthful when they talk about importance of undergraduate education without mentioning research needs in the same sentence. So why do public universities think they can compete with private ones? First, let's do the numbers. Figure 1. 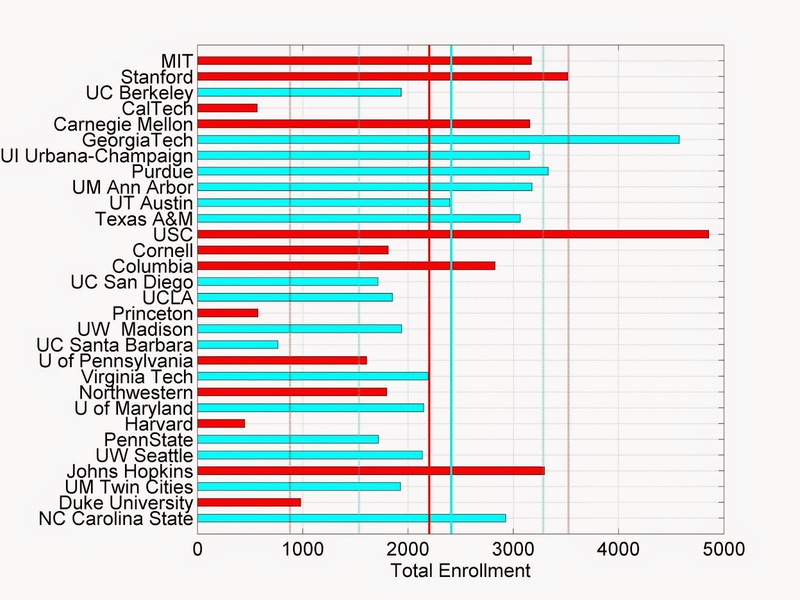 Total enrollment in the top 30 U.S. graduate programs in engineering. The top private universities are in red and the top public ones in blue. Notice that in contrast to their small undergraduate enrollments, some of the top private universities have substantial graduate enrollments in engineering. Simply put, there is a lot more money to be made off of graduate students starting their own companies and filing patents. In general, undergraduate education is a money-losing proposition best left to public universities. Unless, of course, you belong to the nomenklatura and a gentleman's C is in store for you, especially if daddy kicked in a few million dollars to his/your private Alma Mater. Source: 2013 rankings by US News & World Report. Figure 1 shows that among the top 30 engineering programs in the U.S., 17 are public. The mean enrollment and the standard deviation are 2,410 +/- 874 graduate students for the public universities and 2,202 +/- 1,323 students for the private ones. Figure 2. Nominal tuition and fees charged by the top 30 U.S. programs in engineering . For the public universities, these are in-state tuition plus fees. For the private universities the tuition and fees are for full-time students. Texas A&M is an anomaly in its reporting, quoting $258 per credit, the number that is incomprehensible to the public and suggests an almost free education. In this plot I did the translation. Notice that NC State, Texas A&M and UT Austin charge the least for graduate education. These charges are below cost and must be subsidized from their respective endowments. Source: 2013 rankings by US News & World Report. 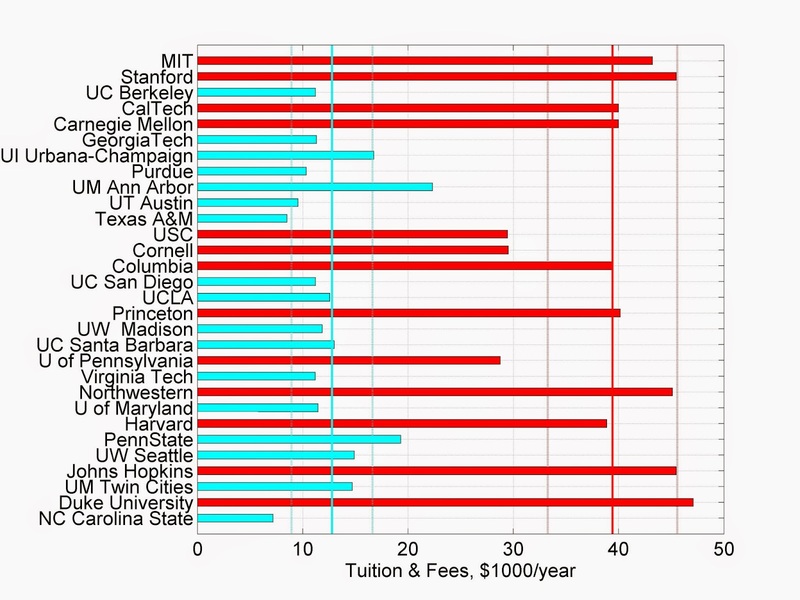 Figure 2 shows that the mean tuition and fees and their standard deviation are $12,787 +/- $3,840 for the top public universities, and $39,426 +/- $6,148 for the private ones. In short, a good private university charges three times more on average than a good public university. Figure 3. 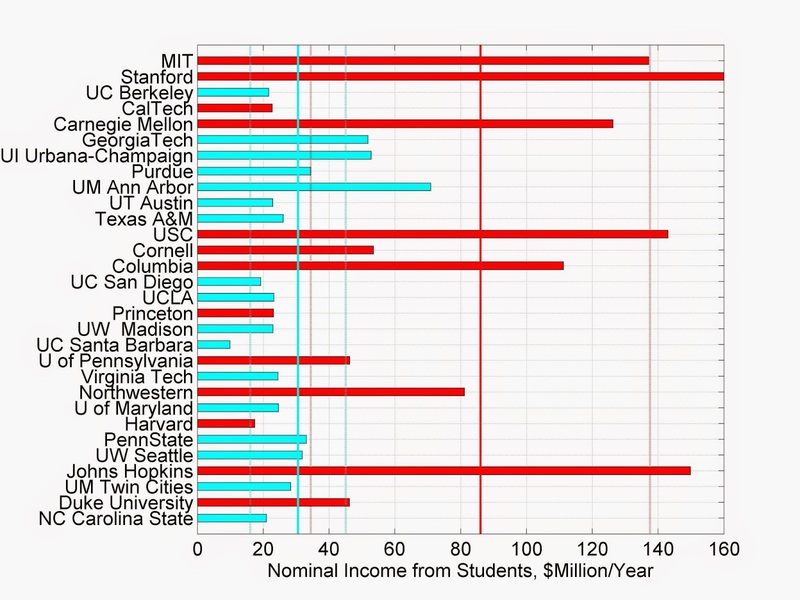 Nominal income from the current graduate student populations in the top 30 engineering programs. Source: 2013 rankings by US News & World Report. Figure 3 shows that the mean nominal income and its standard deviation are $30.5 +/- $14.5 million per year for the top public universities, and $86.0 +/- $51.6 million per year for the private ones. So what's the conclusion here? Public universities can fight their way to the top of graduate rankings in engineering despite income that on average is three times less than that of private universities. When it comes to merit and funding from competitive public sources (NSF, NIH, DOE, DoD, etc. ), creativity and ambition more than make up for the lack of most other resources relative to private universities. But this victory of sorts of public universities is a Pyrrhic one. By focusing on research these universities undercut the already meager support of the public, which knows nothing about research and advanced degrees, and does not care. The public cares, however, a lot about their high-school graduate sons and daughters, who cannot get into the overextended and underfinanced public universities. For example, my department of Petroleum Engineering at UT Austin already has a 40:1 overall student:faculty ratio and in 2014 had to reject 13 out of 14 candidates for freshmen. At the same time, the public keeps on hearing a loud chorus of voices that tell them the following: Public universities should deliver cheap and shoddy education for the unwashed masses, and they should stop competing with the private barons and princes of education, who mostly serve the affluent cast. The public at large is generally uneducated about research and advanced degrees, and deceived. As it so often happens in America, people actively oppose what might be good for them, because they are conned into believing that they all are incipient millionaires, who have been poor by accident just for the first x-years of their lives. I do not need to remind you that being poor in America is deeply shameful. Shame makes people pretend that they are who they are not, and vote against their self-interest. P.S. I wrote this blog on 2/28/2014, but out of disgust could not make myself publish it until today. A week ago I had a medical incident that made me rethink many things. Chief among them is the creeping betrayal of more than half of U.S. population, from the poor professional soldiers and veterans, to the lower 50% of the population in K-12 schools, which receives eduction at a level below most third-world countries, to a burgeoning population of the less-than-affluent people, who want to send their children to public universities, but cannot, because these children were insufficiently educated in their dismal K-12 schools, and later must compete with the better-to-do families, whose children also flock to public universities. Let's hope that the wrecking ball falling on undergraduate public education in the U.S. will be less than awesomely devastating. Judging from what already happened to K-12 schools, I am not holding my breath. Please pay attention to the ever-louder demands for (academic) teacher "accountability." That's how it starts. And it goes down from there. Edward Bernays, who was an honest original propagandist, must be turning in his grave. Bernays genuinely believed that manipulation of the disoriented masses by the enlightened elites served good social purpose and improved civil society. Many high schools today do not have real teachers of sciences, but they do have accountability and mechanical, mind-numbing tests for the young inmates. The purpose of these tests has been to indoctrinate the obedient, schematically thinking, and disoriented young consumers, not enlightened thoughtful citizens. Think then of best public universities as intensive care units, in which some of the young patients are brought back to life. This important link to an article "Americans Think We Have the World’s Best Colleges. We Don’t" on the utter mediocrity of most U.S. colleges at bachelor level was added on 6/29/14. Simply put, most graduates of the generally mediocre K-12 schools in the U.S. are never resuscitated by U.S. colleges, no matter how highly the respective graduate programs in these colleges rank. Remember that the U.S. graduate programs in math, physics, chemistry, and engineering are mostly for the gifted foreign-born students. I often hear from this from great American kids: "How can I compete in (PhD-level) math with all these foreign-born students?" How will I then pass the PhD qualifying exam? So these kids never become PhD students. I could write a whole dissertation on how low on average the analytic math and programing skills are among American undergraduate students. I would be describing my personal teaching experience over the last 25 years. Other serious problems affecting performance of U.S. colleges involve child poverty, poor nutrition or malnutrition, lack of family support, increasingly language problems, and so on. These problems are not nearly as severe in other developed countries. P.S.P.S. Those few public high schools that still work are severely segregated, so that the well-to-do are served and others aren't. While I do not mind elite high schools protected by difficult entrance exams, I attended one after all, their admission procedures need to be transparent and well-publicized, and good alternatives for the less prepared/gifted children must exist. I have a feeling that in the U.S. such alternatives do not exist. P.S.P.S.P.S. And here is how the private for profit universities fared and what they have done to tens of thousands of their students. A decade ago, Corinthian Colleges was a darling of Wall Street which valued it at $3.4 billion, and was used as a shiny example for the outdated public universities. After wasting billions of dollars of taxpayer's money and thousands of student lives, Corinthian Colleges will have to fold. And, yes, public often underwrites private profit and then pays for private losses. Hey!!! I like the valuable information you provide in your articles. I’ll bookmark your weblog and check again here frequently. I am quite sure I will learn many new stuff right here! Best of luck for the next. You can also visit ICE GATE INSTITUTE for Ahmedabad GATE. Good post you shared here i hope you will write more. Thank you so much for sharing this article in detail.